Disclosure: A product sample was received. All opinions stated are genuine and my own. Usually it's the boys who get the cool flying toys, but this go around Spinmaster Toys has made sure the girls get a whirl (literally and figuratively speaking). 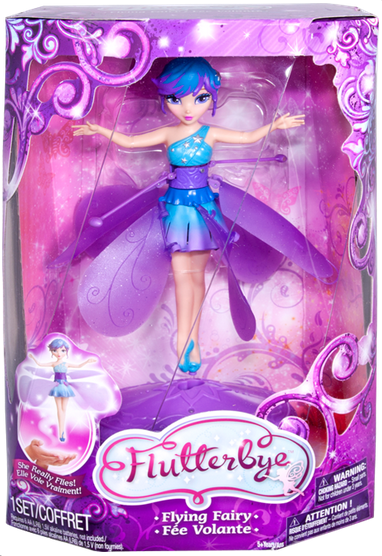 The Flutterbye Fairy comes in several styles (colors), and runs on 6 AA Batteries (not included). Operating her is simple: Your Flutterbye Fairy sits in the rechargeable base until it is time to use her. When you want her to fly you simply push the button and away she goes. You put your hand beneath her (not touching her) to make the flight go up, down, left, or right. It works like a charm and flies very smoothly. I cannot imagine any little girl not loving this toy. I remember stuff like that, wasn't there sky dancers or something that did the same thing back in the day? So cool for a little girl, I know just the one who I can get this for. What a great gift this will make. How cute is this!?!?! Love it. My kids had something like this and I swear I played with it as much as they did. So fun! I'll pass. I doubt my niece would enjoy something like this. oh boy, I definitely would have wanted a flying fairy when I was that age! Very cute! They look pretty cute, might get one for my niece so! present sorted! If I had girls, this would be awesome. But I know for a fact that my boys wouldn't want anything to do with one of these. That is pretty cool! My daughter is hitting the big teenage years in a couple weeks, so I am sure she won't be into one of these anymore, but great for the younger set! This is such a cute girls toy for the upcoming holiday season. What fun stuff kids have access to these days. I never had such toys when I was a kid, many years ago. That is very cute. My step daughter collects fairies and has two little girls, they'd love this. My daughter had something like this when she was little--skydancers. They were really cute. Love it so cute and Purple! My girl's favorite color is Purple, this will surely be in my Christmas list. My girls absolutely love these kind of flying dolls. I remember they had one kind of like this a few years back that they played with so much until it broke. I may have to get this one and see how well they like it. Well that's pretty neat indeed. The girls will surely have one of these. We saw those the other day and my daughter flipped! She wants one so badly! They are definitely adorable. I used to play with something like this as a kid! Oh goodness, my daughter would be ALL over that! the flying component is really cool. VERY cute -- and awesome!!! I'm noting this for Christmas gifts! Oh my kids have seen the commercial and my daughter thinks it's pretty neat looking! My daughter loves fairies. Who am I kidding? My son does too! This is adorable. I have a friend's daughter I need to buy a gift for and this just might be it! That would be a great Christmas gift for a little girl. My granddaughter isn't old enough for that yet but I know she would love it. That's a really cool toy. Great for christmas gifts. Madison is still too young for it but I have a god-daughter who would love it. This looks like a cool toy and something my daughter would love. I am definitely checking this out for Christmas this year. These are so cute. I haven't heard of them before but I am sure that my girls would love it. It's so cute . I am sure my little sister would wanna have it. Really? I thought only boys can get flying items! So so so cute! My little girl would love this. She was fascinated by the Winx Club characters who happen to be flying fairies. My grand daughter would love this. Guess I will add it to the Christmas list. What a pretty doll. I love the colors of her costume and that she can fly through the air. My daughter had a Tinkerbell one of these when she was small, it was a big hit! This seems rather fun. I love that it twirls. I can see my daughter doing the squeal for it. Anne from The Pink Momma is here!! 15% Discount Coupon for AM Candle Company!! Woohoo, My 'Baby' is 6!